Prominent horseman Rod Therres has set up shop for the rest of the summer here at Century Downs. 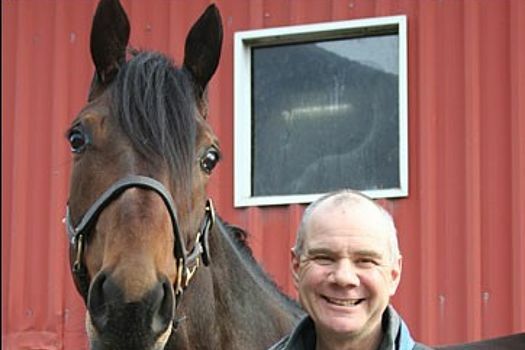 Therres has been in the business of Standardbred horse racing for over 20 years and has been an advocate for healthy and safe horse racing standards wherever he races. However, that’s not the only reason Therres has come to Century Downs. “I went to the [ASHA] Yearling Sale last year and bought a MYSTERY CHASE filly called ROCKIN MYSTERY and she is eligible for all of the stakes here as well as CANADIAN PHAROH who is eligible for the Ralph Klein stakes,” said Therres. Therres’ horses will be competing in these stakes race on August 6 at the Mid-Summer Classic, the final day of Century Downs’ Calgary Racing Festival. Friends and colleges have also drawn Therres back to Century Downs. “Back when I was still in B.C. at the beginning of my career, I worked for Serge Masse,” said Therres. A few years later, the roles have reversed and Masse now drives a few of Therres’ horses in the big stakes races. “It’s a great combination, Masse and I – people talk about it quite a bit,” said Therres. However, this industry can come with its challenges. Therres has faced quite a few demons during his career and overcoming them was a major accomplishment. Instead of turning to the regular celebrations after a race day, Therres decided he was going to throw a pancake breakfast for everyone later on in the week. “I wanted to do something different than the usual parties. One morning I was jogging a horse and talking to my higher power and it hit me that a pancake breakfast would be a great alternative way to celebrate the racing team, grooms and the backstretch,” said Therres. As we kick off the Calgary Racing Festival, we wish Therres, ROCKIN MYSTERY and CANADIAN PHAROH the best of luck on August 6! #YYCRACINGFEST Money Madness draws every night from July 28-August 6 for $500 at 7 and 8 p.m. If a winner is not found, the amount will roll over to the next day! Packwood Grand on July 28 where you can experience the luxury of old-world leisure and horse racing. Get your tickets now at packwoodgrand.com! Century Downs’ Charity Golf Tournament benefitting Two Wheel View at Woodside Golf Course in Airdrie on August 2. Register now by emailing infocenturydowns.com or by calling 587-349-7771. Our 3rd annual Libations Fest on August 4 where you can enjoy free samples of over 30 local craft beers and international wines and ciders. Industry Day on August 5 where you can learn about the different aspects of horse racing from the experts. Sign up for a free barn tour by emailing barntourscenturydowns.com. A high-fashion and high-stakes day of horse racing on August 6 at the Mid-Summer Classic.